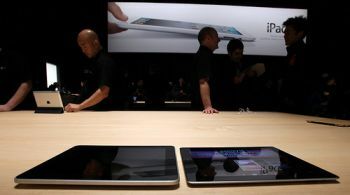 iPad 2 launch. iPad 1 on left and iPad 2 on right. Photo by Robert Scoble. Anticipating long lines and limited supply, and believing we’d increase our odds of both scoring a new iPad2 on Friday afternoon when Apple kicked off sales of its latest toy, we split up. Turns out we were wrong – the limit was only one device at Best Buy – but we both made it home that evening with the latest flagship Apple product. I’ve owned my iPad2 for just a few days now but adore it already. An hour-and-twenty minute movie on my flight to D.C. burned only 16% of the battery and was gorgeous to watch. It’s sleek, slick, powerful, and smooth. Scoble is right: it’s all about the apps, and the iPad app universe is nothing short of fantastic. This morning’s post isn’t about the iPad itself, though, but about the folks who designed the buying experience at the two stores. And the punch is as predictable as it is important: design matters. The Apple store experience, in typical Apple fashion, was all about the customer. Smiles and free water to everyone waiting in line, a welcoming handshake for every customer as they entered the store, a bunch of staff on the floor quickly helping everyone as they walked in, cashing folks out on the spot with their mobile cash registers (which are themselves pretty cool), staff willing and able to answer questions and help customers find accessory products, salespeople congratulating customers, free advice about using the new iPad2, mini-classes going on in the back, the Apple store itself with it’s so-cool-I-kinda-want-to-hang-out-here vibe. The Best Buy staff were super friendly (which, sadly, stands out in the world of electronics retailers), but the accolades stop there. The buying experience was designed, as far as I can tell, for the convenience of the store managers. Those of us lucky enough to get a ticket for the device we wanted ended up in a new line in the back of the store. I spent forty minutes waiting to buy my new iPad surrounded – not by other Apple products, not by the newest high-definition televisions, not by gaming consoles, not by Best Buy staff talking about their favorite iPad apps or offering tips on how to use the new device, not by anything I might have found even vaguely interesting – but by refrigerators and washing machines. The conversation the day before was probably straightforward. “Where should we have them line up?” “Well, that row of refrigerators is long and straight, and that’ll keep them in the back of the store out of the way.” While we waited (a Whirlpool side-by-side for just $899.99! ), salespeople walked up and down the line hawking Smart Covers and a few other accessories. Helpful, I suppose, they offered no value to the experience except perhaps for the transaction itself (I ended up buying the Smart Cover, btw, which rocks). The line then clogged at the too-few temporary registers, and it all just felt cheap . . . long, portable tables covered with cheap tablecloths and filled with registers and a few more accessories they hoped we would buy. The entire transaction consisted of my (admittedly friendly) salesperson trying to upsell me on one thing after another. And the experience didn’t offer any time to wander among what should have been (but wasn’t) an irresistible display of cool Apple stuff I might want to grab to help my new mobile device feel at home. In short, Best Buy had a captive audience and an opportunity to surprise and delight us all. They didn’t. They viewed the experience as a one-off, a chance to work a trapped audience who might be upsold on covers and extended warranties. Apple, like much of what it does, put the user first when designing the experience, fueling and validating their enthusiasm and excitement, reminding everyone just how much fun it is to go to the Apple store. Every time we organize a community decision-making process, a brainstorming session, or any other project we might work on, we are serving as designers of a process that really matters to the people participating. Conventional planning and community outreach puts the planners and the staff first: the questions are asked in ways that make sense to city staff, the documents are written by planners who picture themselves as the audience, and the format is engineered for efficiency at the expense of a rich, engaging experience by community members. The results are as predictable as my experience as Best Buy was: community members don’t feel heard or valued nor do they feel ownership over the experience or the outcome. The planners can check “public participation” off their to-do list, but that public input didn’t add any real value to the process. And ultimately the decisions won’t be as valuable, effective, or as durable as they could have been. Every planning process ought to delight the community members involved, and every one ought to add real value to the participants outside of the simple transactions and decisions involved. If people leave a process we designed and don’t feel that they understand the issues and trade-offs better than when they started, or that they know their neighbors better now than at the beginning of the project, or that their voices were actually heard (even if they outcome isn’t what they hoped for), and that their community or organization will be better off for having experienced the process, then we haven’t done our job. And I think this is true for anyone guiding a community decision, designing an art exhibit, crafting a lesson plan, or building a participatory democracy process.